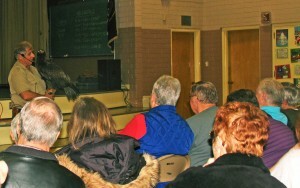 CEDAR CITY – Introducing a long list of birds of prey that live in western North America, from pygmy owls to bald eagles, Southern Utah bird expert Martin Tyner took a gymnasium full of animal lovers on a wildlife journey Monday night at North Elementary School in Cedar City. 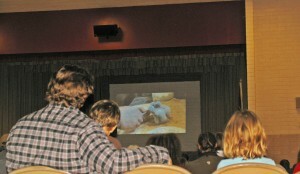 The falconer spent an hour and a half educating an eager audience of all ages on truths and myths about the animals and his life rehabilitating them. Tyner and his wife cofounded the nonprofit Southwest Wildlife Foundation in September of 1997, working to rehabilitate wildlife and educate the public about the wildlife they work with. 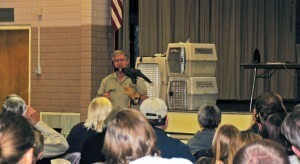 Many of the great birds of the western U.S. live in Southern Utah, Tyner said – including turkey vulture, California condor, Peregrine falcon, Red-tailed hawk, golden and bald eagles. Though most of the eagles in Southern Utah are golden eagles, there are 17 nesting pairs of bald eagles statewide. 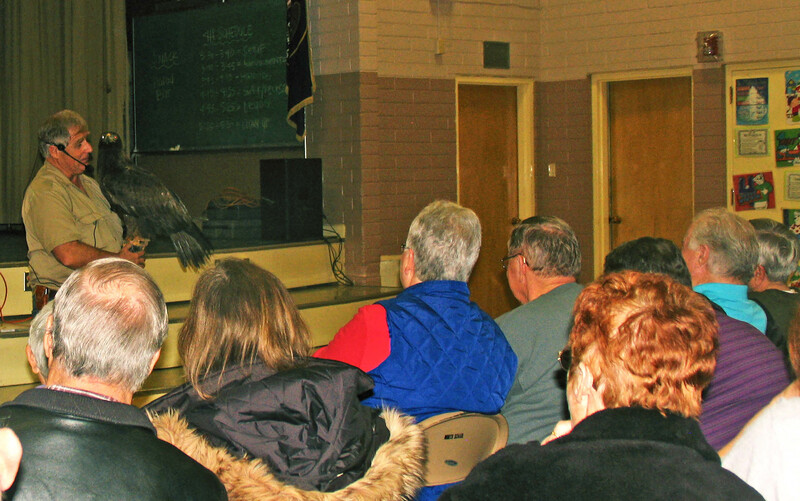 Bald eagles and golden eagles get their names from the color of the feathers on their head. Bald eagles are not born with their characteristic white feathers on their head, they are born with brown feathers that turn white later. As a result, many people confuse them with golden eagles until they mature. The interactive audience roared with laughter, squealed with excitement and heaved with disgust at the stories Tyner shared about eagle lice, vampire bats, vulture vomit and his first date with his wife – she got a little more than she bargained for. “I took her hunting with (my) hawk,” Tyner said. “I get the hawk out of the car and onto my glove, and as my then-girlfriend approached, my hawk turned around and faced her and growled violently at her. Then my hawk turned back around facing me, lifted his tail and pooped on her. “That was our first date, and she married me anyway so it’s her fault,” Tyner said of the 36 years she has tolerated his wildlife shenanigans. 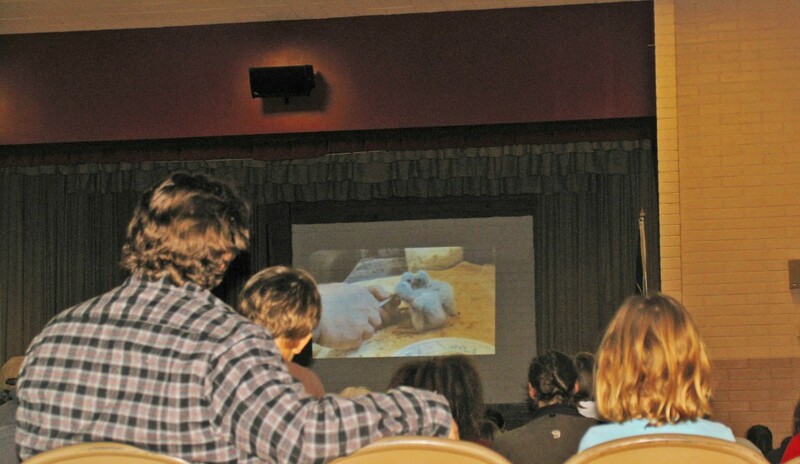 Tyner took his audience through a PowerPoint presentation, delivering one adventure after another in photos and video of various birds he has rehabilitated and released back into the wild over the years. Tyner doesn’t keep the animals he nurses back to health, he said, because his goal is to return them back into the wild where they belong. 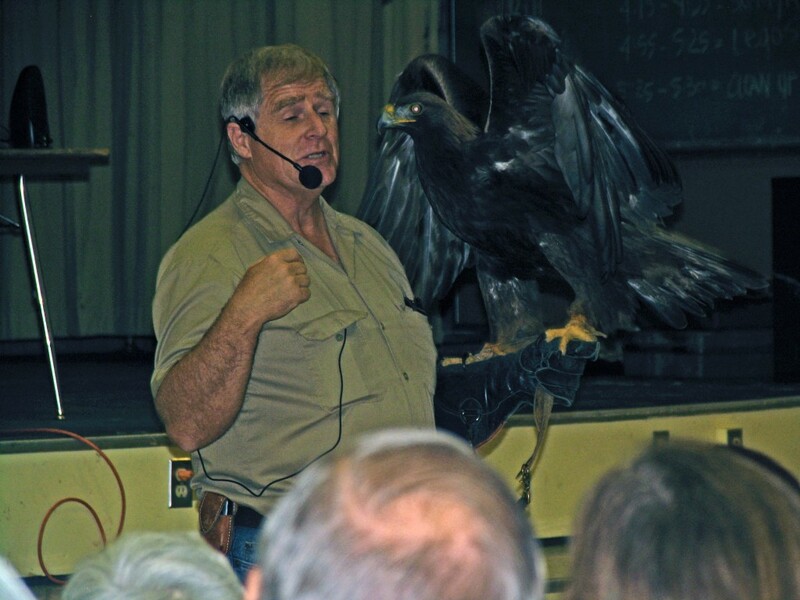 Tyner’s three birds, Scout, a golden eagle, Cirrus, a prairie falcon, and Thumper, a Harris’s hawk, came with him for the evening’s entertainment, giving the audience an up-close look at birds typically only seen in the sky.